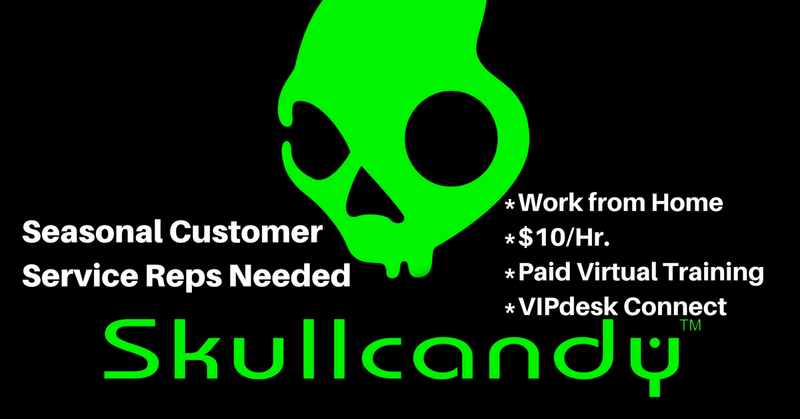 VIPdesk Connect is again hiring Seasonal Customer Service Reps for its Skullcandy account and other brands. “Work 32-40 hrs. per week.” But apply or share quickly if interested — virtual paid training begins Oct. 5. Skullcandy makes popular audio and gaming headphones and related accessories. After paid virtual training, you’ll be doing support via phone, chat, email, social media, etc., for Skullcandy as well as brands such as ASTRO Gaming. The last time we covered this position, about a year ago, the pay was listed as $10/hr. We assume the current rate is at least $10/hr., but will update here if we hear something different. Employee reviews on Glassdoor give VIPdesk Connect 3.7 stars out of 5. To go to the job listing, click here. For more jobs like this, check our Newest Jobs & Gigs page. To get a jump on job offers, like our Facebook page and check your feed for our posts. May you be rocking your Rebellion soon! PLEASE SHARE this post with other Rat Race Rebels! This entry was posted in Work at Home Jobs and tagged Skullcandy, VIPdesk Connect. Bookmark the permalink.